Great Aycliffe Town Council delivered a stinging appraisal of Russ Gibson’s attempt to revive the Aycliffe Show – saying it was his lack of experience which undermined it. 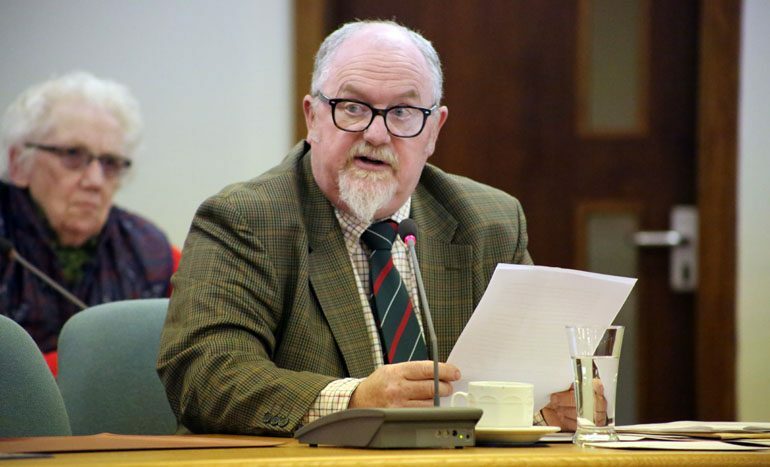 Town Clerk Andrew Bailey had already assassinated Mr Gibson’s application with a behind-closed-doors report – refusing the Newtonian access to the recreation committee meeting which discussed it on January 17. And although the organisers refute many of Mr Bailey’s claims – some of which they say can be proven to be inaccurate and not true – councillor Jed Hillary (pictured above) reiterated the authority’s concerns when he was wheeled out to deliver a pre-prepared, written response to public questions during a full council meeting on Wednesday night. “The council must satisfy itself that the event organiser is technically competent to organise and deliver a large-scale event, in order to protect the council from potential liability,” said Labour councillor Hillary, who was apparently speaking on behalf of the council’s recreation committee. “No evidence of the company’s (Great Aycliffe Events Ltd) track record in delivering events was provided, nor was the evidence provided that the event manager had the necessary competencies to deliver such an event, as requested. “At no point in the discussions prior to submission of the application, was the council made aware that they were dealing with a private limited company. Mr Gibson has angrily responded to some of the council’s appraisal. “The majority of the issues raised in his appraisal came as news to me,” he said. “Andrew Bailey never highlighted many of these concerns before we submitted our application or during our discussions.